Recently, over on the Yog-sothoth.com forums someone asked an interesting question relating to hand-written props for a Call of Cthulhu game. 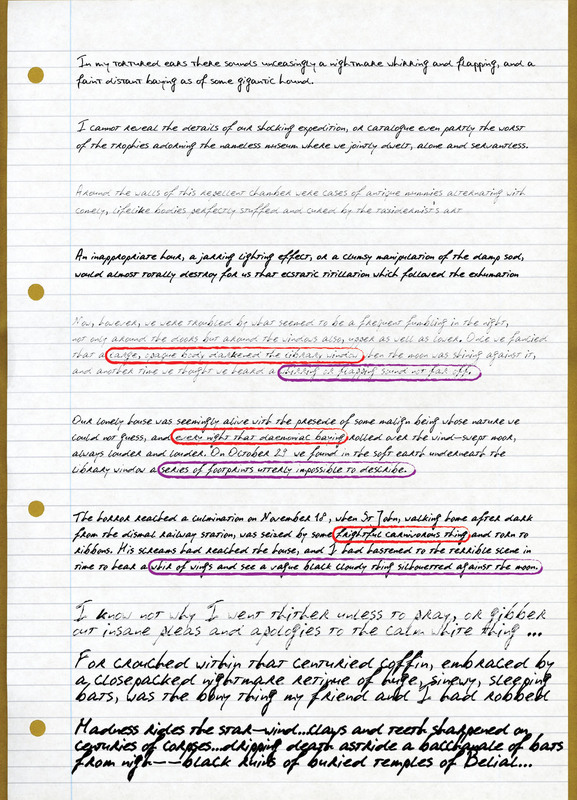 In a nutshell: how do you create large hand-written documents where the writer’s slow descent-into-madness is evidenced through the qualities of his or her handwriting? The most obvious way is to create such a thing manually, but this has some drawbacks (very time-consuming, limited to your own handwriting style, etc). Using one of the many “realistic handwriting fonts” that are readily available commercially or for free seems like an enticing alternative … but how do you go about the process of deteriorating the quality of the writing as the fictitious writer goes slowly mad? The proper solution to this problem would be for someone to invent a family of fonts which captured the same glyph-shapes under different types of stress. But that sounds like a lot of work to create, and (to my knowledge) nobody has ever put that much time into this rather specific problem. I’m certainly nowhere near skilled enough to create fonts like that … but I do have some knowledge of using modern font-editing programs to warp and modify existing fonts. So, as a quick-and-dirty pseudo “solution” to this problem I thought I would have a go at taking an existing (freeware) font and seeing what could be done to distort the glyphs in a way that suggested first mild emotional stress, then modest madness, then full-blown insanity. Before I got to creating insane handwriting, I needed a “sane-looking” font which represented the writer in a normal (sane and emotionally-balanced) state. I cruised over to dafont.com and found an excellent free handwriting font called PhontPhreak’s Handwriting. I used two variants of this font to represent “normality” — the first is a fully-upright version. and the second is a slanted version. Slanted handwriting always suggests (to me, anyway) a degree of urgency … like the writer is under some kind of pressure. So I thought that could represent a base-line of emotional duress from which to begin a descent into fonty madness. Now, there are obviously many ways to convey insanity through writing in a prop. The mental conflict of the writer might make them angry or desperate, which might be conveyed through heavier strokes and bolder letters. Equally, the stresses of encountering something terrible might make someone nervous and frail, which could be suggested through a lighter more wispish handwriting. In order to allow for either option, I started off by making a lighter and heavier version of the slanted font. These I figure might be useful (in isolation or together with the base font) to document the earliest steps down the road to madness. Armed with these I started playing around with manipulating the shapes of the letters. I did this in two main ways — firstly by warping the glyphs using a wavy-shaped envelope. That gives a kind of overall impression that the writer is struggling to make the normal letter shapes due to a “disturbed” state. The other distortion I tried involved adding in lots of extra points around the glyphs and randomly jittering them around. This gives a “shaky” effect, like the writers hand is unsteady. The samples below show what these look like for light, medium and heavy versions of the font. 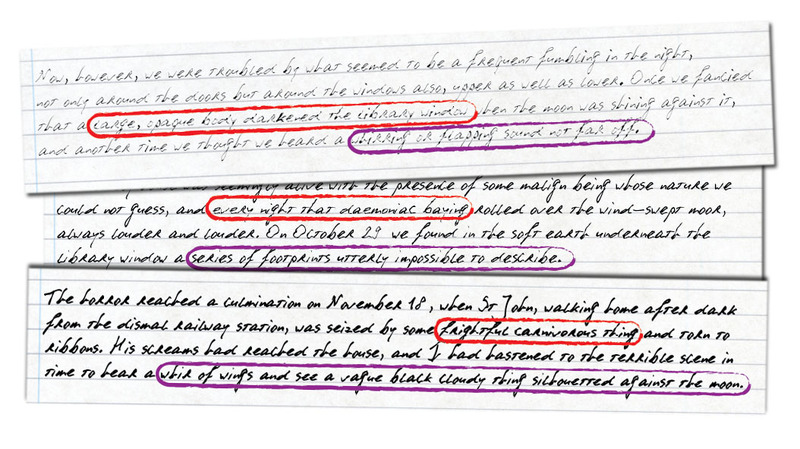 Most of the text is distorted by the “wave” effect; the bits circled in red are treated with the “shaky” effect, and the sections circled in purple have both effects applied. Each manipulation of the base font produces a new font in the broader “family” … so already by this stage there are over a dozen different but related fonts. Conceivably these could be mixed and matched in lots of different ways to make all sorts of different versions of the inevitably decline into drooling idiot. One last thing I tried was to overlay a couple of these different variant glyph-shapes to create a “doubled-up” effect. Lots of fonts which aim to convey a “psycho killer” slash “Jack the Ripper” kind of vibe seem to obsess on the notion that a madman (or madwoman) would write the same letters multiple times on top of each other. Overlaying the earlier fonts kind of gives that effect. The samples below show this for the light, medium and heavy version of the font family. That’s where my experiment stopped … By the time all the different combinations of effects and weights had been multiplied out, I had created a family of sixteen variant fonts. Doubtless someone could extend this further, but for me I reckon that would give me a design arsenal to tackle lots of different props. Below is a contact sheet showing all the fonts, and below THAT some download links you can click to get the fonts themselves. The original font used as the basis of this experiment, PhontPhreak’s Handwriting can be downloaded from daFont.com and is free for personal OR commercial use. The variant fonts I have created can be downloaded as a ZIP file using the link below and are similarly free for personal or commercial use. This entry was posted on Sunday, June 2nd, 2013 at 3:25 am	and posted in Cthulhu Game Aids, Prop Elements, Tips & Tricks. You can follow any responses to this entry through the RSS 2.0 feed. Great stuff. I love all of your game aids – the attention to era-specific detail is awe-inspiring. Keep up the good work! What font editor do you use? I started out with Fontastic (an early bit-map font editor) and later got Fontographer. These particular fonts were created using Fontlab Studio 5 … assisted greatly by that tool’s intriguing “batch operation” functions which let you apply a variety of tweaks to every glyph in a font with a single click. Nice if you want to experiment with special effects on the same font.